Where can Ohioans call for answers to complex questions? For more than thirty-five years, Information and Referral (I&R) services have helped people find answers. These services have the potential for increasing, by thousands, the number of people helped, but one major obstacle exists. Many people are unaware I&R services are available and therefore struggle to find answers to their questions about community resources. What a difference it would make if these people could simply dial 2-1-1 and talk to a trained and knowledgeable person with access to accurate information! Information and Referral (I&R) services are the link between people and community organizations. With more than 26,600 nonprofit organizations in Ohio and scores of government agencies, many people find it challenging to navigate the maze of community resources. I&R specialists assess callers’ needs and determine the best service provider. I&R services maintain comprehensive databases of resources, including federal, state and local government agencies, community-based organizations, and private nonprofit organizations. Currently, Americans make approximately 13 million calls every year to I&R services. In Ohio, I&R services responded to at least 1.1 million calls last year. The 2-1-1 / Crisis Hotline responded to over 32,000 calls from Licking, Knox, Morgan, Muskingum, Perry and Washington Counties during the last year. 2-1-1 is an easy-to-remember and universally recognizable telephone number that makes a critical connection between individuals and families in need and the appropriate community-based organizations and government agencies. On July 21, 2000, the Federal Communications Commission (FCC) ruled that the telephone number 2-1-1 be designated nationwide as the number to call for access to community information and referral services. The FCC stated that there is “sufficient public benefit to justify the use of this scarce public resource”. As of February 2015, 2-1-1 serves over 291 million Americans – over 93.5% of the entire population – in all 50 states (including 39 states with 100% coverage) plus Washington DC and Puerto Rico. Every few weeks, those numbers increase. In Canada, 2-1-1 currently covers more than 60% of the population. When was 2-1-1 started in Knox & Licking Counties? 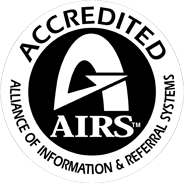 Ohio AIRS (Alliance of Information & Referral Systems) designated Pathways as the 2-1-1 provider for Licking County in January 2007 and Knox County in January 2008. Pathways began providing Licking County 2-1-1 services in October 2007 and Knox County in June 2008. Pathways has provided Crisis Hotline and Information and Referral Services for over 45 years. Can I call 2-1-1 from a phone where I work? Usually. Some companies block 3-digit calls from business phones because of fees that can be associated with those calls. If that’s the case at your company, we hope you’ll ask that 2-1-1 be “unblocked.” Your employer will not incur any fees for 2-1-1 calls made by employees. 2-1-1 is not an emergency line. Call 9-1-1 if you’re facing a situation that requires help from police, fire or medical resources. 2-1-1 is available to you, by phone, 24 hours a day, seven days a week, 365 days a year. Call anytime you need help. How is 2-1-1 funded? How can I donate? 2-1-1 is a service of Pathways of Central Ohio. This program is funded in part by Mental Health & Recovery for Licking and Knox Counties, United Way of Licking County , United Way of Knox County, United Way of Morgan, Muskingum and Perry Counties, United Way of Washington County, Licking County Foundation, and Energy Cooperative Operation Round Up Foundation. Anyone living, working or visiting within Knox, Licking, Morgan, Muskingum, Perry and Washington Counties who has the ability to access 2-1-1 via a land line or cell phone. If you cannot access 2-1-1, please call 1-800-544-1601 or, in Licking County, 740-345-HELP (4357). Can persons under 18 years of age call 2-1-1? When you call 2-1-1 you will receive the assistance of a trained professional in helping you to determine what referrals and what plan will meet your specific need. If I text 2-1-1, what can I expect? When you text 2-1-1 you will receive the assistance of a trained professional in helping you to determine what referrals and what plan will meet your specific need. What types of information do you give out? 2-1-1 provides information on about 700 agencies and 5097 programs that serve Licking, Knox, Morgan, Muskingum, Perry and Washington counties that can provide assistance for a variety of needs. Examples include referrals for emergency shelter, rent or utility assistance, substance abuse, elder services, relationships, food, depression, employment, health care, abuse, parenting, crisis intervention, suicide prevention and disaster recovery. What if I need services from a county or area outside of Licking and Knox counties? 2-1-1 will connect you with an information and referral source in your area. You may also visit 211.org. What type of place is this? Do you have money to help me? This is an information and referral center and a crisis/hotline that you can reach by dialing 2-1-1. 2-1-1 is a simple to remember number that connects you with a trained professional who can assist you in defining the problems you are experiencing and providing resources that can help you address the issues you are experiencing. 2-1-1 in Knox, Licking, Morgan, Muskingum, Perry and Washington Counties does not provide direct financial assistance but can provide you with referrals to programs that can provide financial assistance. What exactly do you do? Do you provide counseling? 2-1-1 of Pathways of Central Ohio is a blended center. It not only provides information and referral, it also provides crisis management and suicide prevention. While we do not provide counseling, we do help you problem solve and help you to determine what referrals and what plan will meet your specific need. The 2-1-1 / Crisis Response Specialists receive 50 hours of training before they even begin answering the phone. New staff is required to be in pursuit of a degree in a helping profession. With sufficient training and experience, crisis response specialists can take part in testing to become Certified Information and Referral Specialists. Where are you located? Can I come in and talk? Your calls go to a location that is confidential. 2-1-1 does not provide face-to-face service so you can only speak with a staff person by telephone. Can you look things up for me on the Internet? We can assist you with finding ways to access the Internet in the community. We will use the Internet occasionally to help find resources. Can I just talk about stuff or do I have to have a crisis? The 2-1-1 service was set up to assist people who are having difficulties and to address any issues they may be having. How long can I talk? How many people are there? As long as you are working to develop a plan to address your needs, 2-1-1 staff will work with you. At times, problems can be overwhelming and require more than one phone call. Staff will invite you to call again at your convenience. There are two staff on shift at all times. Where can I get help with paying my electric bill/ gas/ rent? Who can help me? Dial 2-1-1 to be connected with programs that provide utility and rental assistance in Knox, Licking, Morgan, Muskingum, Perry and Washington Counties. I need a ride to my doctor. Is there anyone who can transport me? Dial 2-1-1 to be connected with transportation services in Knox, Licking, Morgan, Muskingum, Perry and Washington Counties. I am depressed. Where can I get counseling? Dial 2-1-1 to be connected with programs that provide counseling, mental health or substance abuse services in Knox, Licking, Morgan, Muskingum, Perry and Washington Counties. I need medication and have no money. Who can help? Dial 2-1-1 to be connected with programs that provide prescription expense assistance in Knox, Licking, Morgan, Muskingum, Perry and Washington Counties. Will 2-1-1 work from my cell/mobile phone? 2-1-1 will work with most cell phones that originate service in Knox, Licking, Morgan, Muskingum, Perry and Washington Counties. If you are unable to use 2-1-1 from your cell phone, please let us know. You can also reach 2-1-1 by dialing 1-800-544-1601 and in Licking County you can also dial (740) 345-HELP (4357). As with any other call you make on your cell phone, you will be charged for airtime. If your cell phone originates from a county other than Knox, Licking, Morgan, Muskingum, Perry and Washington, you may be connected to a 2-1-1 service in that county. Simply program our 800# in to your phone for future calls.